Native Americans make a salve out of pine sap to sooth mild skin irritations. This remedy also removes splinters. Rub pine-sap salve on a wood or glass splinter, and within a few days the splinter will force its way out of your skin. 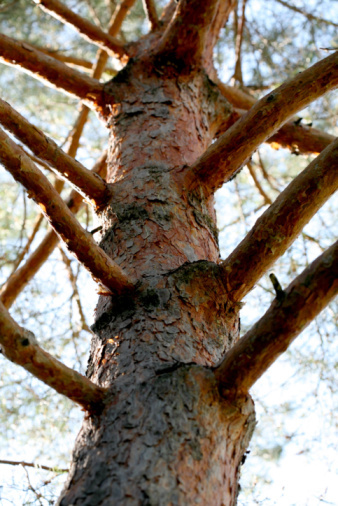 The pine sap stimulates the blood flow around the splinter, pushing it out of the skin. Pine sap is sticky and hard to remove from clothing, so wear clothes and shoes you don't mind getting sap on when gathering the ingredients for and making the salve. Remove splinters with a salve made from pine sap. Pry sap off a pine tree's bark with a screwdriver. Place the soft sap into a saucepan you don't mind ruining. Place hard sap pieces into an old cloth. Fold the cloth containing the hard sap. Hit the cloth with a hammer until the sap pieces are broken into pea-sized pieces. Add the sap pieces to the saucepan. Add 1 oz. beeswax and 3 oz. olive oil for every 2 oz. of pine sap. Place the beeswax and olive oil into the saucepan with the pine sap. Heat the saucepan on medium until all ingredients are well mixed. Strain the salve through a piece of cheesecloth to remove debris. Pour salve into a glass jar and label the jar with a marker.